Martin first worked in the business as a stand-up comic and a dancer. However after leaving Loughborough University with a Master of Science degree and a large overdraft he moved into theatre and event management. In addition to his producing credits for all of UK Productions shows to date, Martin has worked on a number of unique events including the Nations 50th Anniversary of D-Day commemorations for Her Majesty’s Government, the Tour de France in the south of England, and Portsmouth’s 800th anniversary and VE day celebrations. 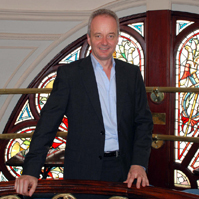 Martin managed the 1500 seat Guildford Civic Theatre and the 2228 seat Portsmouth Guildhall and was responsible for moving the management of the latter and its associated Outdoor Event Management programme into the private sector in 1995.